Hold your horses. We’re only joking. It would be wrong for us to strike allegiance with either shade of blue. Especially as in the run up to the 2016 Boat Race we cannot deny our Oxfordshire roots. 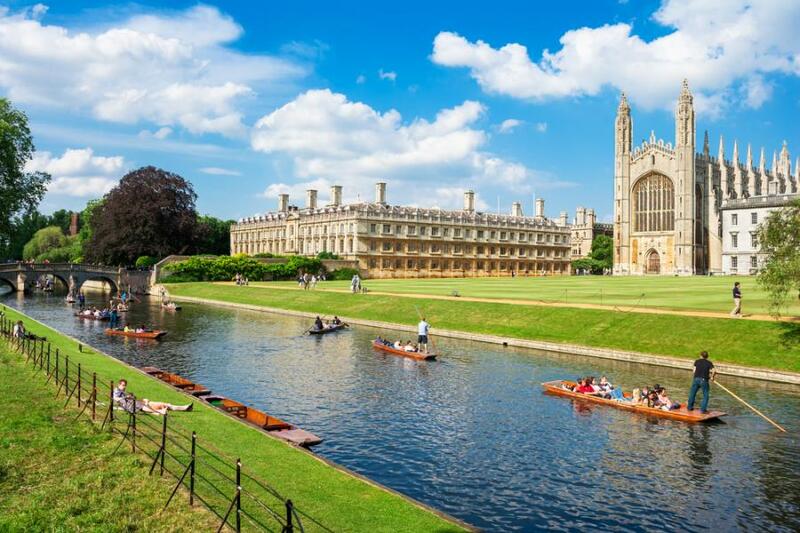 Those aside, let our provocative headline bolster your Oxbridge knowledge as we take you on a tour of 15 things you might not, but probably should, know about Cambridge. 1. Cambridge is known as the second city of learning based on the theory that it was established by scholars fleeing Oxford University. Although it took 75 years for the first college (Peterhouse) to be established from the date of the university’s formation in 1209. Today there are 31 colleges, three of which still only accept women admissions: Lucy Cavendish, Murray Edwards, Newham. 2. Naturally, there’s more than a fair share of sporting prowess here. We’ve previously touched on Cambridge’s narrow lead over Oxford in the varsity boat race. Within the competitive walls of collegiate rowing if you spot a clock on any of the college boathouses it’s an accolade recognising the club’s 10 consecutive wins in the university head of the river race. 3. Cambridge are known as the Light Blues and Oxford as the Dark Blues in any varsity competitions. Cambridge are also referred to as Tabs – derisively so by Oxonions, yet this term is also casually applied by Cambridge students themselves. 6. If you’re visiting the two universities and expecting much of a muchness, you’ll find both differing architecture and a largely different terminology for all things relating to the university from how they name terms through to what they call the grassy area in the middle of each college. 7. Although that is quite the opposite of the tactic played by Lord Byron during his time in the city. He kept a pet bear in his university rooms at Trinity College Cambridge because college rules banned the keeping of dogs. 8. Cambridge University is home to the greatest number of alumni to hold a Nobel Prize in physics (there are 29 of them) and a further 60 alumni have won Nobel Prizes across other disciplines. 9. And with 29 physics Nobel Prize winners, you don’t need us to tell you that science is a bit of a thing. But let’s name some names: Stephen Hawking, Sir Isaac Newton and Charles Darwin top the fame list. 10. Other famous alumni include the founder of the Bank of England (Charles Montagu), inventor of the sandwich (John Montagu or 4th Earl of Sandwich), Charles Babbage (think 1800s computing) and Charles Rolls (of Rolls Royce). Despite the humanities-science myth, while Oxford definitely lays claim to producing the most prime ministers, Cambridge has contributed on that front too, including the very first prime minister of India: Jawaharlal Nehru. 11. Alongside Lord Byron and its Nobel Prize winners, Cambridge University’s alumni proudly boasts well known names of poetry and literature too: C.S. Lewis staked a claim in both Oxbridge universities, A.A. Milne (Winnie the Pooh), Francis Bacon, Tennyson and Zadie Smith (White Teeth). Not forgetting Colin Dexter, the creator of Morse, one of Oxford’s most famous fictional detectives. 12. Alongside Shakespeare’s scrawls, you’ll find A.A. Milne’s original manuscript of Winnie the Pooh in the library at Trinity College. That’s just one of 100 libraries across the university campus. And collectively they house approximately 29 million books. You’ll need more than a long haul flight to work your way through that lot. 13. Cambridge is essentially a market town with a strong agricultural community and that hasn’t changed much in 800 years. The largest contrast to its heritage is Silicon Fen – a Cambridge suburb created by a growing influx of medical technology companies making the city their base. 14. Hobson’s Conduit, a fresh water inlet in the city, was constructed in the early 17th century and still exists today, though less so for its original purpose of watering visitors and their horses. It’s now protected as a Scheduled Ancient Monument. 15. Cambridge is the home of football. Well, it is thought that the first game of football, most like that of today’s game was played in the city centre park, Parker’s Piece, way back in the 1840s. The “Cambridge Rules” of the games were used when the FA established its game governance in the 1860s. No comment on the city’s footballing achievements of more recent memory. So there you have it. A tour de force of all things Cantabrian. And it’s from that name of Latin origin that the term Tab was also derived, so not all that offensive after all. Just like Oxford, a Cambridge city break is brimming with an inspirational history, stunning architecture and a way of life for its transient student population that will fascinate and bemuse visitors to this revered seat of learning. Whichever shade of blue you find yourself wearing next weekend, good luck and make sure you get yourself to these wonderful cities some time soon.